stores and killing people like chickens. some money. It was said by some people that Oyenusi was romantic. girlfriend. It was also said that Oyenusi was hot tempered and arrogant. all! This earned him the name “Doctor rob and kill“. 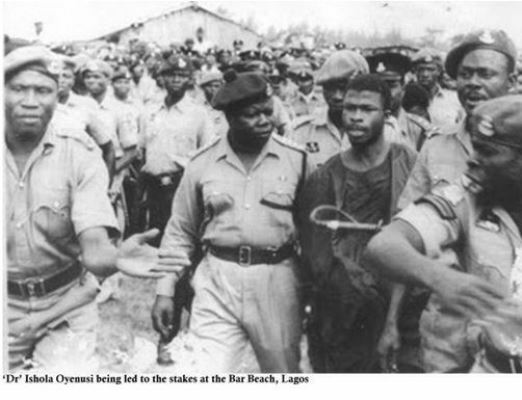 At the height of his horrific reign, Oyenusi bragged that “the bullet has no power“. He probably forgot that he who live by the sword will surely die by the sword. Oyenusi was so infamous that he was regarded by some people as the “first celebrated armed robber in Nigeria“, and after him was Lawrence Anini, Babatunde Folorunsho (Baba oni lace), Shina Rambo, Buraimo Jimoh and others. named Mr. Nwi and stole $28,000 as at then. before the law and found guilty then sentenced to death by firing squad. Ogbolumain, Ademola Adegbitan and Stephen Ndubuokwu. see the man who had terrorized them get riddled by hot bullets. nothing but a scapegoat whose breath would be exhausted in any moment. was sweating profusely but managed to smile all the way to the stakes. him to secondary school.He also said “I am dying for the offense I have committed“. voice let out the word “fire“! Oyenusi and other criminal’s body were sprayed with bullets.That was the bitter end of Ishola Oyenusi who lived by the bullets and died by the bullets. The execution of Doctor Ishola Oyenusi sent the streets of Lagos deserted at night.Families locked themselves behind doors for the fear that some of Oyenusi’s boys might retaliate. expected, Eddie Ugbomah was threatened and later, his store was looted. eventually releasing the movie in 1977.In recent times, a Nollywood actor, Odunlade Adekola, also released a movie (Oyenusi) detailing the life of Ishola Oyenusi, the notorious Nigerian armed robber.